What are your daily reads? Which feeds can you not do without? I have just been trimming back my feed reading after realizing yet again I was just trying to consume too much. Luckily my feed reader allows me to mark each feed with a star rating, allowing me to trim from the bottom. Also I have my feeds in folders, so I was able to delete a full folder of items I never read. Here below are my 5-star daily reads, exported, unedited, exactly as they are in my feed reader of choice, BlogBridge. Import the OPML file here. You will notice my own blog is included. This isn’t vanity (well, maybe a little, heh). I think everyone needs to subscribe to their own blog and check every item you post. How else would you know if something is wrong? 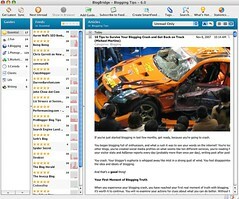 In fact really I should subscribe in various readers, but I only really use BlogBridge. Over to you, which blogs are on your daily reads?